The 1914 Star was introduced in 1917 and awarded to members of the British and Indian Expeditionary Forces (including civilian doctors, nurses, and other military hospital personnel) for service in France and Belgium between 5 August and 22 November 1914. The Bar was awarded to recipients of the Star who had actually served under fire during the qualifying period. Introduced in 1918, the 1914/15 Star was awarded to those who saw service in France and Belgium from 23 November 1914 to 31 December 1915, and to those who served in any other operational theatre from 5 August 1914 to 31 December 1915. The 1914-15 Star is identical to the 1914 Star excepting that the central scroll is titled "1914-15" rather than "Aug-1914-Nov". If a man or woman qualified for either Star then qualification for the British War & Victory Medals was automatic. 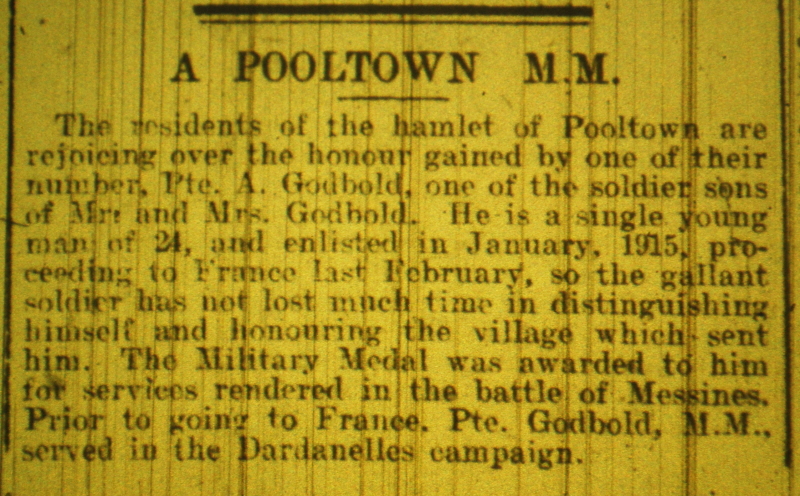 Authorised in 1919, this medal was awarded to eligible service personnel and civilians. The basic requirement was that they either entered a theatre of war, or gave approved service overseas between 5 August 1914 and 11 November 1918. Qualification was extended to service in Russia in 1919 and 1920. This was the most widely awarded of the service medals with almost seven million issued. 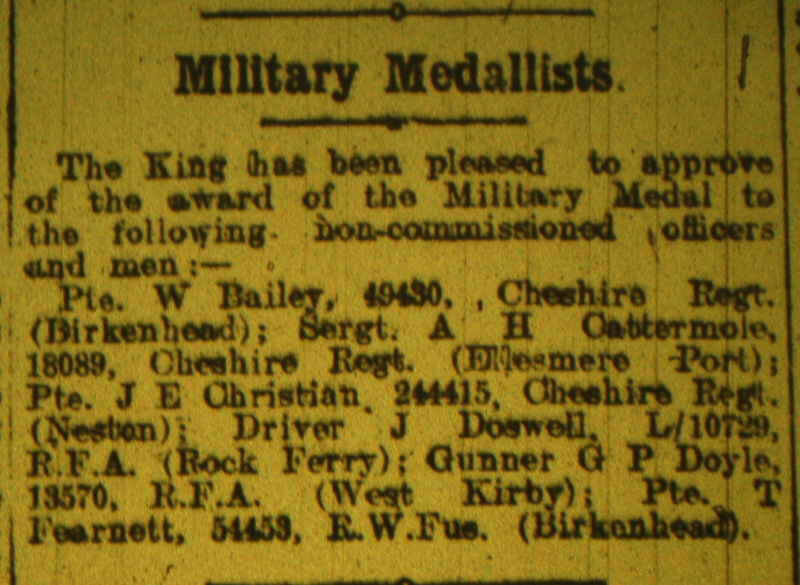 The Victory Medal 1914-1919 was also authorised in 1919 and was awarded to all eligible personnel who served on the establishment of a unit in an operational theatre. 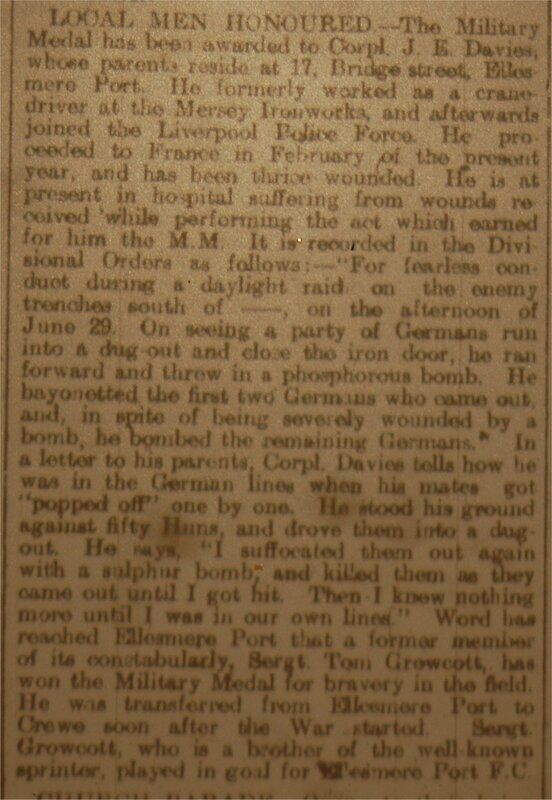 It was not possible to be awarded the Victory Medal unless you also had the BWM qualification and all recipients of either the 1914 or 1914-15 Star automatically qualified for the BW & V Medals. This extract is from the book The Home Front During the First World War - Canal Port at War by Mike Royden(2014) and describes those that were awarded military honours during the First World War. (Under copyright - please do not publish this or use without permission). Second Lieutenant Leonard Richmond D.S.O. 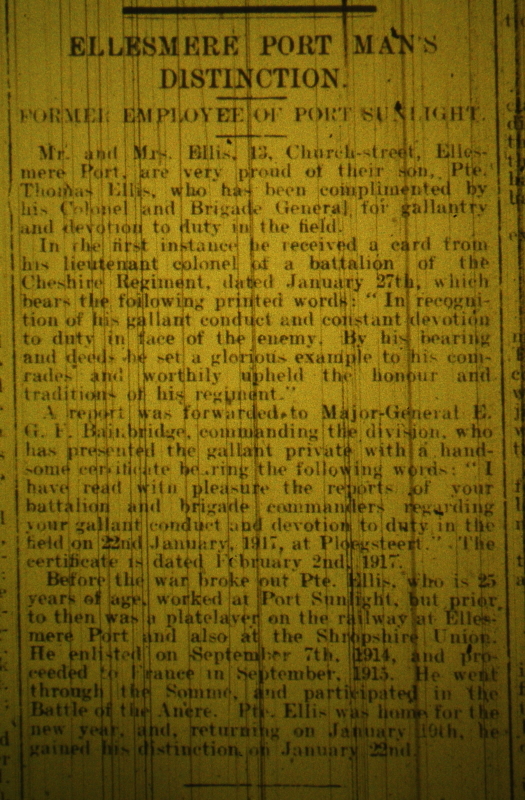 The highest honour bestowed on a local Ellesmere Port man was the Distinguished Service Order (D.S.O.) 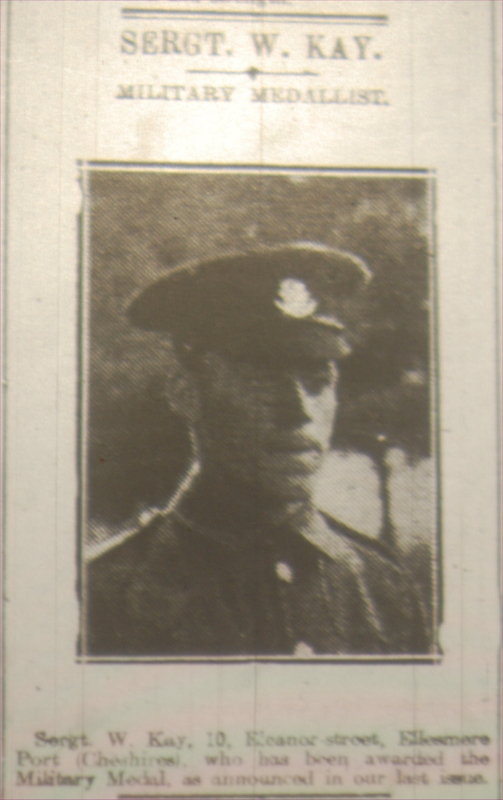 conferred up Second Lieutenant Leonard Richmond. 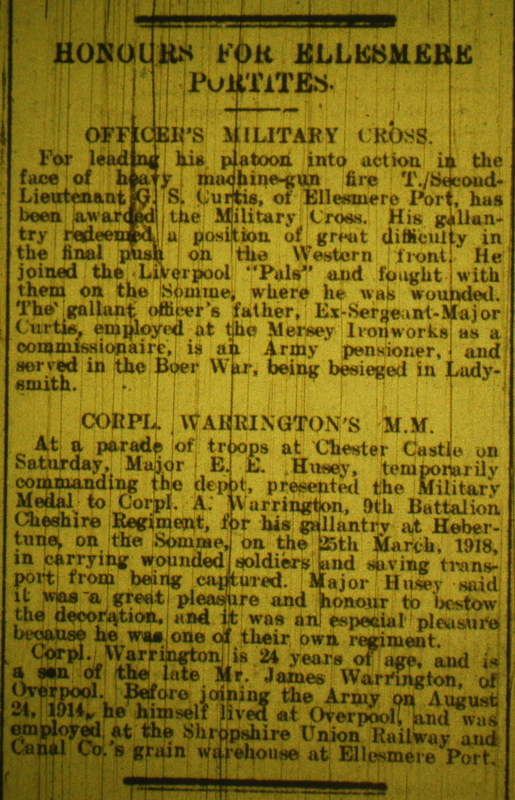 He was also awarded the French Croix-de-Geurre with palm (the second highest level of the ward). Leonard was born in Norley in the Delamere Forest area of Cheshire. (Researched by Mike Royden - please do not publish this or use without permission). Temp Second Lieutenant G.S. Curtis M.C. 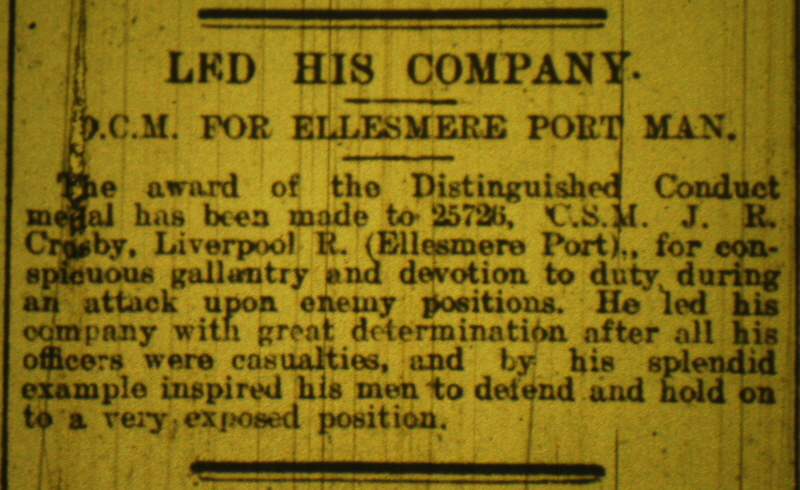 Lance Corporal G. Cadman M.M. Private John Leonard France M.M. Lance Sergeant George T. Hacking M.M. Lieutenant J.T. (Harry) Stone M.M. There may be more awards, but this is the known list so far, gleaned from a variety of records including Medal Cards, Soldier’s War and Pension records, the London Gazette and various newspapers. I would be grateful if anyone with further information about recipients, or omissions, could get in touch.